We have multiple coating options at YourBoxSolution.com. To receive a sample of our coating options, please fill out our sample request form here. All of our boxes are made from a pretreated paperboard. This treatment primes the paperboard prior to printing so that the ink has a solid adhesion to the paperboard that will not rub off in a retail setting. It has a nice semigloss finish that can be embossed, debossed and foil stamped. We do not recommend spot gloss embellishment to this box. On this actual sample, there is no post print, coating or laminating to the box. This is the most cost effective option that we offer. Gloss laminate is applied using a film that is applied to the box after it has been printed. It is not a liquid coating and thus creates an even better barrier to protect the ink. Laminate adds thickness and strengthens the box making it more ridged. For example our 16pt paper goes up to a 17.2pt after lamination is applied. Our 18pt goes to a 19.2pt paperboard after the laminate has been added. Gloss laminate can be embossed, debossed and foil stamped. We do not recommend spot gloss embellishment to this box. This is a very durable laminate that is our strongest and most scuff resistant laminate we offer. This laminate is applied the same way as the gloss laminate but it is a very smooth and matte look and feel. It is a great laminate for customers that would like a softer sheen but not a full true matte finish. Scuff proof laminate also adds thickness and strengthens the box. This laminate can be embossed, debosess, foil stamped AND spot gloss coated. This laminate completely changes the look and feel of the box. The boxes have a trye matte finish and have an almost rubber like finish to them. 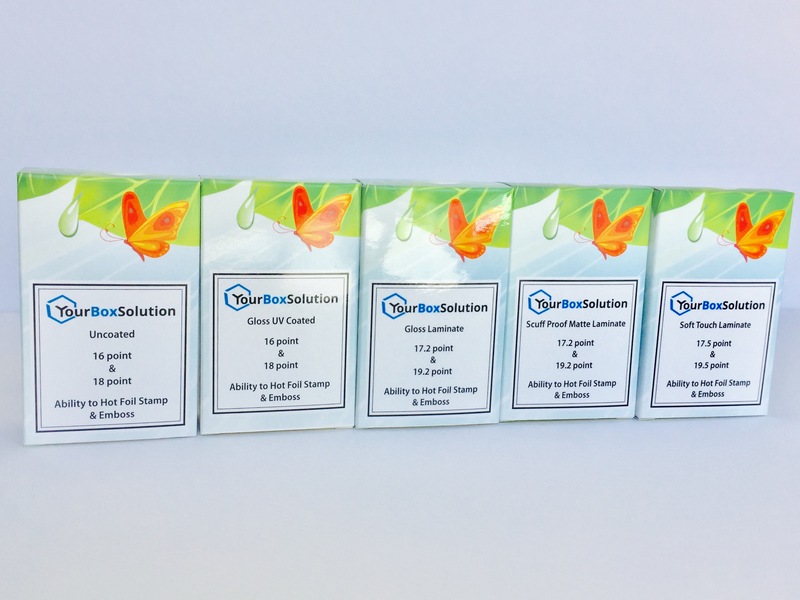 This laminate is ideal for skincare or cosmetic companies looking for a luxurious box. Just like the other laminates, scuff proof adds strength to to the box making it more ridged. This laminate can be embossed, debosess, foil stamped and spot gloss coated. For samples, fill out our online sample request form to receive samples of our previous work. These samples will show you first hand our great print quality, the types of boxes we manufacture, and give you some inspiration when creating your own packaging design. You will also receive 5 samples of the same size box, each with a different coating option. This will allow you to see and feel the differences. Please contact us if you have any questions. We would love to talk with you.